Zebra mussels are small animals with a striped, D-shaped shell composed of two hinged valves joined by a ligament. The shells are typically one-quarter inch to one and one-half inches long, depending on age, with alternating yellow and brownish colored stripes. Adults are typically fingernail-sized. Zebra mussels attach to hard surfaces underwater. 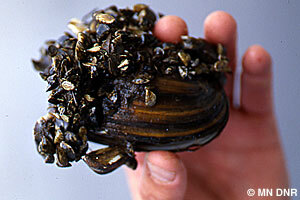 A single zebra mussel can filter one quart of water per day while feeding primarily on algae. They live underwater, attached to natural and manmade substrates such as rocks, wood, plants, native mussels, pipes, docks, boat lifts, swim rafts, moored watercraft, and other debris. A female can produce 100,000 to 500,000 eggs per year. Fertilized eggs develop into microscopic, free-living larvae, called "veligers," that form shells. After two to three weeks, the veligers settle and attach to a firm surface using tiny fibers called byssal threads. Beds of zebra mussels can reach tens-of-thousands within a single square yard. The zebra mussel is native to Eastern Europe and Western Russia. The species was unintentionally introduced into the United States’ Great Lakes through the discharge of contaminated cargo ship ballast water. They were first discovered in the Great Lakes in 1988 and were first confirmed in the Duluth/Superior Harbor in 1989. Refer to EDDMapS Midwest for current distribution. The zebra mussel (Dreissena polymorpha) is a prohibited invasive species, which means it is unlawful (a misdemeanor) to possess, import, purchase, transport, or introduce this species except under a permit for disposal, control, research, or education. Encrust equipment, such as boat motors and hulls, which reduces performance and efficiency and is costly to clean and repair. Swimmers and pets can cut their feet on zebra mussels attached to rocks, docks, swim rafts and ladders. Create a costly problem for power plants, cities and residents when they clog water intakes. Filter tiny food particles out of the water, which can reduce available food for larval fish and other animals, and can increase aquatic plant growth as a result of increased water clarify. Attach to and kill native mussels. People spread zebra mussels primarily through the movement of water-related equipment. Mussels attach to boats, docks, swim rafts and boat lifts. They can also attach to aquatic plants. Adult mussels can survive out of water – less than five days in dry conditions, but up to 21 days in very wet conditions (such as inside dock/lift pipes). Microscopic larvae (veligers) can survive in water contained in bait buckets, live wells, bilge areas, ballast tanks, motors and other water-containing devices. Report new occurrences of zebra mussels to the DNR immediately by contacting your DNR Invasive Species Specialist or log in and submit a report through EDDMapS Midwest. In the United States and Canada, facility managers use pesticides to kill zebra mussels in closed systems, such as water-cooling systems of power plants. Many pesticides used in closed systems are not allowed for use in open water. In natural waters, such as lakes or rivers, attempts to control zebra mussels are uncommon and considered experimental. Starting in 2015, the Minnesota Department of Natural Resources permitted pilot projects to kill zebra mussels in public waters.